No, it's not a euphemism, but the name of a simple manoeuvre that, if widely adopted by motorists, as charity Cycling UK believes it should be, could save lives and help elevate the safety of cities worldwide to that of those of oft-revered cities such as Amsterdam or Copenhagen. Originating some 50 years ago in (no prizes for guessing where) the Netherlands, the Dutch Reach is a method of opening a car door with the hand furthest from the handle, so in the UK, the left hand of the driver, or right hand of the passenger. This means motorists are forced to turn their body towards the door, allowing them the opportunity to look over their shoulder to see whether a cyclist - or motorcyclist - is coming. In the Netherlands it is taught to children both in school and from their parents, as well as being a required section of the driving test. The method has become a central pillar to groups campaigning to put an end to “dooring”, the rather literal name that describes when a cyclist is knocked off their bike by an opening car door. “Dooring” was responsible for 474 accidents across the UK in 2015, according to the Department of Transport (DfT), and also made the news earlier this year thanks to a careless Chris Grayling, the transport secretary, who sent a 35-year-old cyclist flying when he exited his ministerial car without looking. Hitting someone with a car door may sound trivial, but has been involved in the deaths of dozens of cyclists around the world (as of 2013, 25 killed, according to Bicyclesafe.com), including Sam Boulton, a Leicester teacher knocked into the path of van on his 26th birthday last year. Further analysis of DfT data by Cycling UK reveals that between 2011 and 2015 there were 3,108 people injured, eight fatally, where "vehicle door opened or closed negligently" was a contributing factor in incidents attended by police. An instructional video by Outside magazine has become one of the most popular blueprints for how to learn the method, with a YouTube video watched more than one million times. In the simplest terms, the Dutch Reach is opening the car door using your 'far hand', allowing your body to pivot to look behind. 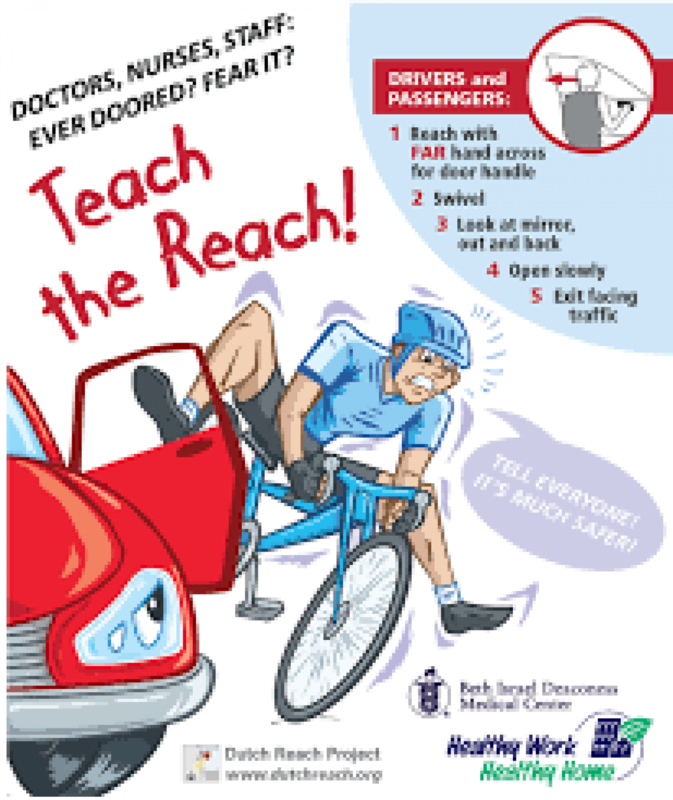 The Dutch Reach Project says: "Look out, at mirror and easily back for bikes and traffic. All clear? Then open slowly, remaining vigilant. “We frequently cite our European neighbours as examples of what we would love to have here, in countries like Denmark or Holland, and it’s the little things like this that can make a difference,” explains Sam Jones, from Cycling UK, a cyclist charity. “We know of families who have lost loved ones because someone has literally just opened a car door. It’s been a big issue for us for a long time. So, next time you park your car, think about the Dutch Reach - maybe put a sticker on your steering wheel or windshield! And tell your friends!